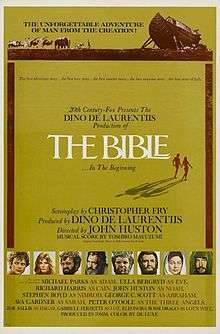 The Bible: In the Beginning... is a 1966 American-Italian religious epic film produced by Dino De Laurentiis and directed by John Huston. It recounts the first 22 chapters of the biblical Book of Genesis, covering the stories from Adam and Eve to the binding of Isaac. Released by 20th Century Fox, the film was photographed by Giuseppe Rotunno in Dimension 150 (color by DeLuxe Color), a variant of the 70mm Todd-AO format. It stars Michael Parks as Adam, Ulla Bergryd as Eve, Richard Harris as Cain, John Huston as Noah, Stephen Boyd as Nimrod, George C. Scott as Abraham, Ava Gardner as Sarah, and Peter O'Toole as the Three Angels. In 1967, the film's score by Toshiro Mayuzumi was nominated for an Academy Award for Best Original Score. The National Board of Review of Motion Pictures included the film in its "Top Ten Films" list of 1966. De Laurentiis and Huston won David di Donatello Awards for Best Producer and Best Foreign Director, respectively. The film consists of five main sections: The Creation, Adam and Eve, Cain and Abel, Noah's Ark, and the story of Abraham. There are also a pair of shorter sections, one recounting the building of the Tower of Babel, and the other the destruction of Sodom and Gomorrah. The sections vary greatly in tone. The story of Abraham is somber and reverential, while that of Noah repeatedly focuses on his love of all animals—herbivorous and carnivorous or omnivorous. Cats (including lions) drink milk, with Noah's relationship with the animals being depicted harmoniously. It was originally conceived as the first in a series of films retelling the entire Old Testament, but these sequels were never made. I was especially surprised by the fact that I started to work four days after signing a contract. Although I've always been interested in movies and the theater, I'd never seen any actual shooting, and it was all very exciting. Huston originally considered Alec Guinness (who was unavailable) and Charlie Chaplin (who declined) for the part of Noah until he finally decided to play it himself. He (Huston) had more faith in me than I did myself. Now I'm glad I listened, for it is a challenging role and a very demanding one. I start out as a young wife and age through various periods, forcing me to adjust psychologically to each age. It is a complete departure for me and most intriguing. In this role, I must create a character, not just play one. Anglo-Persian actress Zoe Sallis, who was cast as Hagar, was originally known as Zoe Ishmail, until Huston decided that she change her name because of its similarity to the name of Ishmael, her character's son. The film marks the debut of Italian actress Anna Orso, who portrays the role of Shem's wife. It also introduced Franco Nero to American audiences; Nero, who was working as the film's still photographer, was hired by Huston for the role of Abel due to his handsome features. At the time, Nero could not speak English, and Huston gave him recordings of Shakespeare with which to study. The scenes involving the Garden of Eden were shot at a "small zoological garden" in Rome instead of a "beautiful place of trees, glades and wildflowers" which had been demolished shortly before the shooting began. Ulla Bergryd, who was cast as Eve, later recalled, "Paradise was, in fact, an old botanical garden on the outskirts of Rome." There were five reproductions of Noah's Ark built for the film. The largest reproduction, which stood on the backlot of the De Laurentiis Film Center, was 200 feet long, 64 feet wide, and 50 feet high; it was used for the long shot of Noah loading the animals. The interior reproduction, which was one of the "largest interior sets ever designed and constructed," was 150 feet long and 58 feet high and had "three decks, divided into a hundred pens" and a ramp that ran "clear around the ark from top to bottom." The third reproduction was a "skeleton" ark, built for the scenes depicting Noah and his sons constructing the Ark. The fourth reproduction was "placed at the foot of a dam" for the inundation sequences and the fifth reproduction was a miniature for the storm sequences. The cost of building the five reproductions was more than $1 million. The building took months and more than 500 workers were employed. The animals were delivered from a zoo in Germany. The whole segment of Noah's Ark had a total budget of $3 million. The Bible: In the Beginning... premiered at New York City's Loew's State Theatre on September 28, 1966. The day after the premiere, Ava Gardner remarked, "It's the only time in my life I actually enjoyed working—making that picture." The Bible: In the Beginning... received generally positive reviews from critics. Variety noted that "the world's oldest story—the origins of Mankind, as told in the Book of Genesis—is put upon the screen by director John Huston and producer Dino De Laurentiis with consummate skill, taste and reverence." It also commended the "lavish, but always tasteful production [that] assaults and rewards the eye and ear with awe-inspiring realism." However, in Leonard Maltin's annual publication, "TV Movies," the film is given a BOMB rating, its review stating, "Definitely one time when you ought to read the book." It also states, "Only Huston himself (as Noah) escapes heavy-handedness." The film earned rentals of $15,000,000 in North America during its initial theatrical release, and $25.3 million worldwide, though Fox posted a loss of $1.5 million. Total domestic box office is by now almost $35,000,000. 20th Century Fox released the film on Blu-ray Disc on March 22, 2011. 1 2 3 Hall, S. and Neale, S. Epics, spectacles, and blockbusters: a Hollywood history (p. 179). Wayne State University Press, Detroit, Michigan; 2010. ISBN 978-0-8143-3008-1. Retrieved 25 March 2011. ↑ "The Bible: In the Beginning, Box Office Information". The Numbers. Retrieved April 16, 2012. ↑ Shevis, James M. (July 15, 1966). "John Huston Narrates Film, Directs, Portrays Noah". The Pittsburgh Press. Retrieved 4 April 2014. ↑ "The 39th Academy Awards (1967) Nominees and Winners". oscars.org. Retrieved 24 July 2013. ↑ "National Board of Review of Motion Pictures - Top Ten Films of 1966". Retrieved 12 July 2013. ↑ "David di Donatello - La Bibbia". daviddidonatello.it. Retrieved 24 July 2013. ↑ "The Great Bible Figures". Retrieved 2011-09-03. 1 2 3 Heimbuecher, Ruth (October 19, 1966). "'Bible's' Eve Disliked Her Fig Leaf Costume". The Pittsburgh Press. Retrieved 4 April 2014. ↑ Pearson, Howard (October 19, 1966). "A Director Speaks - Huston: 'Bible' Unique Film". The Deseret News. Retrieved 2 April 2014. 1 2 "Biblical Role Scares Ava". The Spokesman-Review. September 6, 1964. Retrieved 2 April 2014. ↑ "What's In A Name?". The Pittsburgh Press. December 13, 1964. Retrieved 2 April 2014. ↑ "E' morta l'attrice Anna Orso, Aveva recitato con Al Pacino". la Repubblica. 2012-08-14. Retrieved 2012-09-11. ↑ Texas, Adios (Franco Nero Bio) (DVD). Los Angeles, California: Blue Underground. 1966. ↑ Huston 1994, p. 322. 1 2 3 4 5 6 7 8 "Ark Easier For Noah To Build". The Deseret News. February 2, 1965. Retrieved 2 April 2014. ↑ Crowther, Bosley (September 29, 1966). "The Bible (1966) The Screen: 'The Bible' According to John Huston Has Premiere:Director Plays Noah in Film at Loew's State Fry's Script Is Limited to Part of Genesis". The New York Times. Retrieved 1 April 2014. ↑ Boyle, Hal (October 5, 1966). "Ava Gardner Declares Public Image Not Real". Sarasota Journal. Retrieved 1 April 2014. 1 2 "Review: 'The Bible – In the Beginning . . .'". Variety. December 31, 1965. Retrieved 1 April 2014. ↑ "Bible-In The Beginning Blu-ray". TCM Shop. Retrieved 1 April 2014. ↑ "AFI's 100 Years...100 Cheers Nominees" (PDF). Retrieved 2016-08-13. Huston, John (1994). An Open Book. Da Capo Press. ISBN 9780306805738. Meyers, Jeffrey (2011). John Huston: Courage and Art. Random House. ISBN 9780307590671.